Creosote is a residue that sticks to the inner walls of chimneys and stovepipes, which is comprised of non-combusted fuel particles, commonly known as smoke. Smoke consists of water vapor, gases, unburned wood particles, hydrocarbons, tar fog and assorted minerals. Because of its chemical makeup, creosote is highly combustible. Fireplaces and wood stoves are designed to safely contain wood-fuel fires, while providing heat for a home. The chimneys that serve them have the job of expelling the by-products of combustion – the substances produced when wood burns. As these substances exit the fireplace or wood stove, and flow up into the relatively cooler chimney, condensation occurs. Restricted air supply (decreased draft), flue obstructions (turbulence in the flue), unseasoned wood (moisture content) and cooler than normal chimney temperatures (condensation) are all factors that can accelerate the buildup of creosote on chimney flue walls. Air supply may be restricted by closing the glass doors, by failing to open the damper wide enough, and the lack of sufficient make-up air to move heated smoke up the chimney rapidly (the longer the smoke’s residence time in the flue, the more likely is it that creosote will form). A wood stove’s air supply can be limited by closing down the stove damper or air inlets too soon or too much. Burning unseasoned wood – because so much energy is used initially just to drive off the water trapped in the cells of the logs– keeps the resulting smoke cooler than if seasoned wood is used. In the case of wood stoves, overloading the firebox with wood in an attempt to get a longer burn time also contributes to creosote buildup. Creosote is highly combustible. If it builds up in sufficient quantities – and the internal flue temperature is high enough – the result could be a chimney fire. In 2011, the National Fire Protection Association (NFPA) reports that of the approximately 53,600 reported structure fires in the US which were caused by heating equipment, 38% were caused by fireplace, chimney, or chimney connectors. These fires caused 400 civilian deaths, 1,520 civilian injuries, and $893 million in direct property damage. Creosote is the likely culprit in a large percentage of these fires. Creosote is black or brown in appearance. It can be crusty and flaky, tar-like, drippy and sticky, or shiny and hardened. Often, all forms will occur in one chimney system. Whatever form it takes, creosote presents a hazard and should be removed from your chimney system. 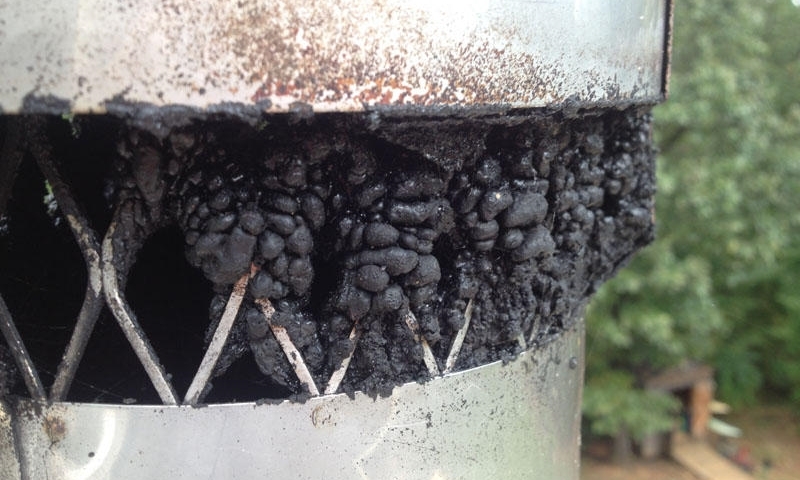 Puffy or honeycombed creosote, is an indicator that your system has experienced a chimney fire. 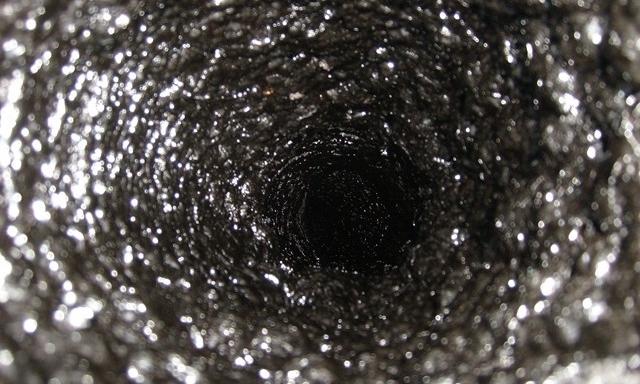 Creosote buildup can affect your heating system in other ways which are harmful to your health. Even small deposits inside your chimney flue can dramatically decrease the draft of your chimney system, causing smoke and carbon monoxide to leak back into your home. Even a buildup of 1/2 inch on the inside of your chimney flue can significantly reduce the draft of your chimney and cause your fireplace or stove to not work properly.